Hand lenses, streak plates and identification information help you find the name of each rock in your new kit. Flow charts or, dichotomous keys, are a great method for identifying rocks and minerals when you are learning about the different sample properties. 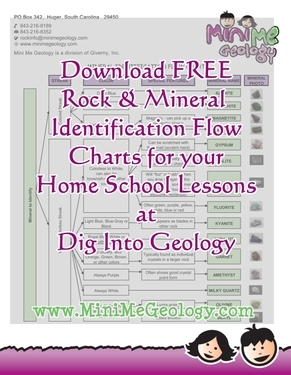 These charts include many common rocks and minerals and will help you identify the samples in your Mini Me Geology kits. Minerals are the building blocks of all of the rocks in our world. Identifying minerals is fun because you can use streak plates to determine a mineral's streak color and household items to determine hardness other special properties. Igneous rocks are made from volcanoes! These rocks form both inside and outside of the volcano. Use this igneous rock identification chart to help you figure out how and where your samples were made. Sedimentary rocks are made in oceans, lakes, rivers and deserts. These different settings give sedimentary rocks a wide variety of textures and colors. Use this identification flow chart to discover the differences in your sedimentary rock samples. Metamorphic rocks were once igneous, sedimentary or other metamorphic rocks that changed over time due to high heat, high pressure or hot water. Use this identification flow chart to find the identity of your metamorphic rock samples.